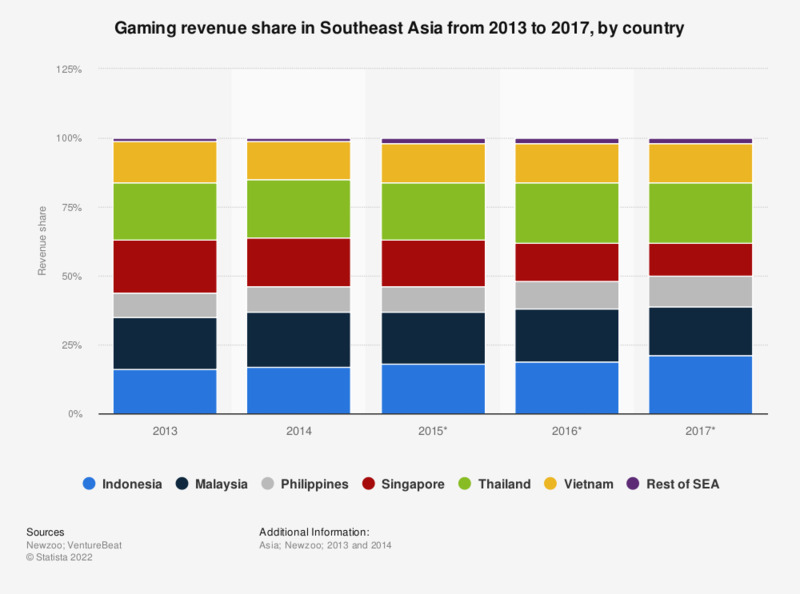 The statistic presents the gaming revenue share in Southeast Asia from 2013 to 2014, with a forecast until 2017, broken down by country. According the calculations, the gaming industry in Southeast Asia will be worth nearly 2.22 billion U.S. dollars in 2017, with Thailand's gaming revenue accounting for 22 percent of that sum. In 2016, Indonesia was to be the largest mobile gaming market in the region, generating over 330 million U.S. dollars in revenue, while Thailand was said to rank second that year. In the same period it was measured that 30 percent of Thai mobile gamers were men between the ages on 21 and 35 years, while 21 percent of same age gamers were women. Everything On "Gaming in Asia" in One Document: Edited and Divided into Handy Chapters. Including Detailed References.